ORGANIZING INSIDE: A Little Time Now Pays Off a Lot Later! Fall has exploded and the cooler weather has set in! The advent of this season serves to remind us that we will soon return to the indoors and begin our winter hibernation, but is your entryway ready for move indoors? Is it overrun with shoes, hats/coats and a plethora of things you’ve been meaning to put away? 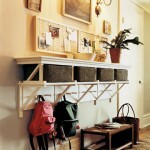 How can you organize your entryway quickly and easily, so that moving back indoors will be more enjoyable? Three simple steps: clear out the clutter, find a home for the homeless items and put in a system that works for your lifestyle. 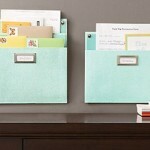 Clearing out the clutter can be simple and doesn’t need to take a lot of time. 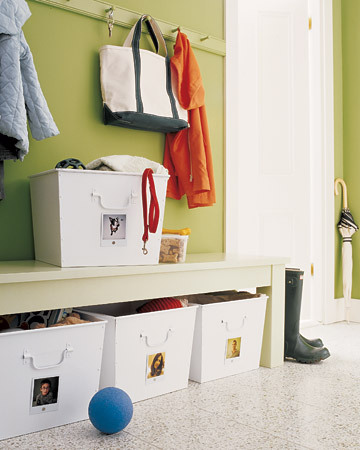 Go through each non-stationary item in your entryway and place it into one of three categories: Stay, Sore Elsewhere or Send Out. When finished, find a home for the the homeless items in the Store Elsewhere category and take the Send Out items to the trash or donate. Your space will actually look bigger when you finish this first part! Don’t foget to do a thorough cleaning of the area to preapre it for the next step. Next, you need to put in a system to keep what’s staying in a neat and orderly fashion so you can get what you need when you need it. 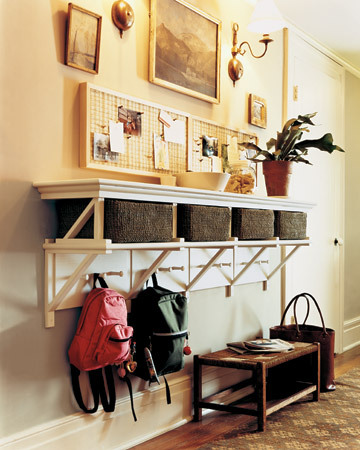 This system could be a simple set of hooks to hang things and a bench to sit on with storage underneath or it could be as elaborate as a custom built wall unit or closet system that is color coordinated. Another step to organizing this space is to contain all the daily paperwork. 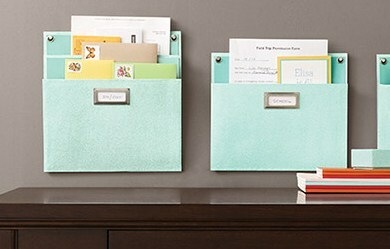 This can be done by hanging up folders on the wall next to or above the hooks for each person in the house. Have one for mail, too, so that you can sit down and peruse it each night; only the important mail should enter the house. 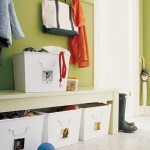 Make sure there is a wastebasket underneath so that items not being saved can be easily tossed out. Lastly, you need to retrain everyone in your home to use the new system(s). Ask everyone to hang up their backpack on the hooks, throw their shoes in the bin and drop the mail/schoolwork directly into the folders each time they enter. If there is a specific place for everything, it won’t take long for everyone to adopt the new habits. So get up and get moving! 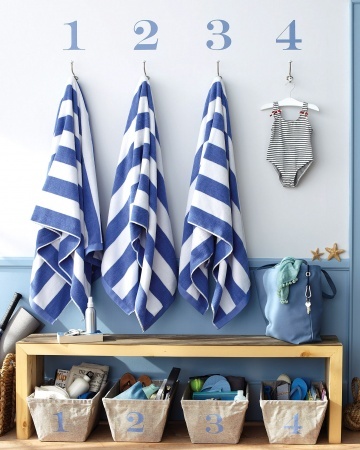 Take the time now to organize that entryway and customize everything in the space you have available and to suit your needs. Once you reorganize this much used area, you will be able to grab all the things you need when you need them. You’ll find moving inside for the cooler months will be a breeze when there’s a place for everything and everything has its place. Remember, a little work now will pay off a lot later!